Today’s episode is another awesome do-it-yourself episode. 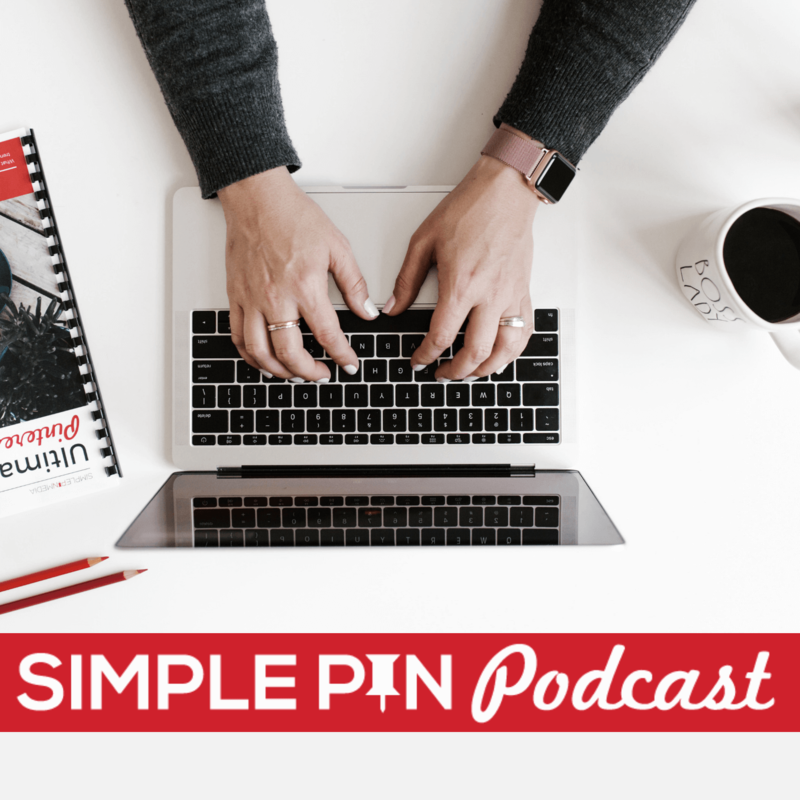 I am currently in a series of episodes where I am offering as much value as I can to those who don’t have it in their budget to hire a Pinterest management company like Simple Pin. If you need to DIY your Pinterest page, then today’s episode is going to be especially helpful for you. I am thrilled to have Chaitra from Pink Pot Studio as my guest today. Chaitra first came on my radar back in Episode 44 when I was talking to Kristie and Chrissa about growing a Pinterest account in a year. Chaitra’s course–iPhone Photography for Creatives — came up in that conversation. This course teaches you exactly how to take Pinterest-friendly photos with your iPhone. Chaitra began her blog as a lifestyle blog back in 2014, but she quickly realized that she was much more interested in the design and photography aspects of blogging. She had also opened an Etsy shop to sell her templates to beginning bloggers and other businesses who were just starting. At the same time, she was working full-time in a corporate position that was bringing her no joy. It didn’t take long before the Etsy shop was providing enough income that she could quit her corporate job and that’s when she created the Pink Pot as a design studio. She began creating stock photos that she shared for free to help other bloggers. As Chaitra’s photography business grew, she began to see advertisements about photos taken with the iPhone 6. As a committed DSLR user, Chaitra was skeptical about the photos, not believing that any phone could take photos with an iPhone that were the kind of quality she was seeing. And then one day her DSLR died on her during a photoshoot and she only had one hour to get the shoot going. She only had one camera left to use. Her iPhone. When she finished with the shoot, she couldn’t tell the difference between the DSLR photos and the iPhone ones. That’s when she got serious about learning all the things the iPhone camera could do. Eventually, she decided that if you know the right techniques you can absolutely use your iPhone to take high quality photos. Maybe you are diligent to make sure that your Instagram photos are just right and your Facebook photos are flattering. Why should you worry about what your photos look like on Pinterest? Today’s online space is moving quickly toward visuals being the most important way to reach an audience. We are wired to respond to visuals. When faced with 2,000 words or a few visuals, people will go for the visuals most of the time. On a platform like Pinterest where thousands of photos are all competing with each other, if your photos don’t stand out from the others, then how will you be noticed? If you have just okay pictures, you will get lost in the sea of pictures on there. So if you want to gain an audience, you have to have photos that stand out from the rest. Stock photos are generic. Not only can you use it, but so can anybody else. How can your photo stand out if 4 other brands are also using it? Stock photos are not customizable. If you want to stand out to draw attention on Pinterest, you can’t do that with stock photos. There is no way to make stock photos unique to your brand. Lighting: Chaitra says that lighting in the most important factor when it comes to any photo. No matter how good your props or background are, poor lighting will always make a bad picture. When shooting indoors, turn all indoor lights off. Go for natural light. Natural light is nearly impossible to replicate with any type of artificial lighting. Shoot in front of the biggest window in your house. This provides that wonderful natural light that you need. If you must shoot at night or in other low light conditions, you should use a lighting kit. Here’s the lighting kit that Chaitra recommends. Zoom: Do you ever zoom in when you’re taking pictures with your iPhone? Have you noticed how grainy those photos look? Zoom on the iPhone isn’t really zoom at all. iPhones use digital zoom, which means that when you hit zoom, the camera just crops the edges of the photo instead of actually zooming in. This reduces the photo quality by changing the number of pixels. So the more you zoom, the worse quality your photos will be. Tripod– What happens if you take pictures of moving objects while just holding the phone in your hand? Blurry, right? Using a tripod can increase the quality of action photos, even if it’s as simple as a tree blowing in the wind. If you tend to be shaky when taking iPhone photos, a tripod will solve that problem. Here’s the tripod that Chaitra recommends. Reflector- What if your photo shoot is scheduled but the day is cloudy and overcast? Can you still get good shots without nice bright sunlight? Absolutely! Chaitra recommends using a reflector, which is a surface that bounces light back onto the scene. This can be as simple as using a piece of white foam board from a craft store. If you’re ready to learn to use your iPhone as your full-time camera, Chaitra offered some tips on just how to get started, and described some of the most helpful parts of her course– iPhone Photography for Creatives. First, you have to understand how to unlock all of the features that can turn your iPhone into your own DSLR. In this section of her course, you learn how to access these features, how to shoot in manual mode, and how to get the “dreamy background blur” effect. Also, the section that teaches styling has been a big hit with her students. You may have beautiful photos, but if they don’t evoke emotions in your follower, they need to be styled. What is styling? It’s simply choosing the right backgrounds and props for the photos, how you place the objects in the photos, using different angles in your shots, etc. Other course modules include lessons on editing your photos and proper lighting. All these tips are great, but what if you have no idea where or how to begin in styling your photos? Is there a way to learn to style them without spending lots of money hiring someone? You bet there is! Go to Pinterest! Chaitra recommends you start a Pinterest board for Photography Inspiration. This board can be secret or public. Start collecting photos that inspire you personally and that connect with your brand. Try to get about 30-40 photos on your board. Now it’s time to analyze them. Spend some time really studying the photos and asking yourself what really stands out to you about them. Is there a pattern you notice? If you were going to use this photo for your brand, what would you change? What attracts you to them? These steps will help you to figure out how you need to style your own photos. What is your favorite aesthetic? What do you want your photos to look like? How can you use props and styling to make your brand stand out from the crowd? Once she defined her style, she stuck to it in order to build her brand cohesiveness on social media. Her audience knows her photos because of her consistency. Once your audience recognizes your style, they will begin to click on your pins because they feel a connection to you. Defining your style doesn’t mean you will have audience recognition overnight. It takes consistency in order to develop the branded look you want. Sometimes it takes time to get things to look exactly how you want them to. Stick with it, keep working at it, and it will come together. And don’t think that once you create your style that you can never change it. Tweaks will be needed, but they must be small in order to not lose your branding. No going from purple and black one day to pink and white the next. The best way to learn how to use Pinterest-worthy photos with your iPhone as your camera is to begin. Learn the techniques, increase your skills so that no matter what type of camera you are using you can take high quality photos, and figure out what features your camera or phone has. Chaitra has blog posts on her site that will help you take better photos. For example, she gives you 12 ideas for photo backdrops for less than $20. And another one here gives you ideas for props for your photos. She also has a shopping guide on where to find discount props, so be sure to go to her blog and read all of these helpful tips on her site! 4:00 Can the iPhone really take such great photos? 6:10 Why do good photos on Pinterest even matter? 27:20 Is the iPhone 7 better or worse than the iPhone 6? IF someone is interested in design and photography pinterest is a nice platform. Doing what we passionate about is what makes us happy and successful. Knowing the right techniques to use whatever resources we have certainly gives us optimum results. Visuals are what people are looking for more than ever and pinterset is all about visuals. So using pinterest is a must. Tips provided by you will help people to know how to use iphone for taking better images. Following our passion with hearty dedication, could surely make a win win situation for you. Pinterest is certainly a platform , if one is interested in photography skills. In this tech world, we can have a success story if we know how to handle the techniques of the given materials. I phone is an amazing gadget and the photography from this device are absolutely superb, but replacing it for a DSLR that is something new to learn here. Can you please link to the Tripod she recommends for iphones? Thank you! Hi Leah! Here is the link to the tripod I love 🙂 https://www.amazon.com/Acuvar-Aluminum-Camera-Universal-Smartphone/dp/B00SHJPMEU/ref=sr_1_4?s=electronics&ie=UTF8&qid=1503087709&sr=1-4&keywords=iphone+tripod I personally use it and love it! Great episode. I remember she spoke about a lighting kit for those of us that have to take pictures at night because we work during the day. Was there a link for a specific one? Thanks so much for your podcast! Taking her class now. Great interview. Yes, her class is phenomenal! Thanks for the feedback.